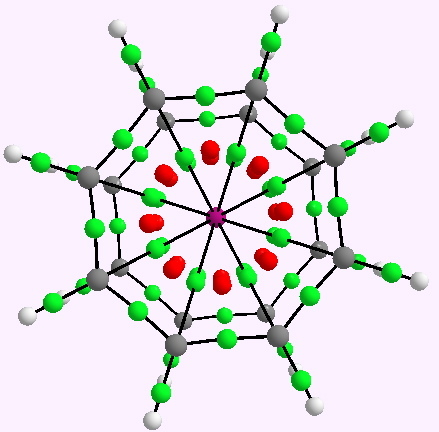 Nobelocene: a (hypothetical) 32-electron shell molecule? Nobelocene. AIM analysis. Click for 3D. There are 16 bond critical points located along the lines of each No..C, with ρ(r) 0.03. This is a very low value indeed for a covalent bond, being of the same order as strong hydrogen bonds, and so should be classed as an interaction rather than a bond. ELF basins cannot normally be located for hydrogen bonds, and neither can they here. Nobelocene in this regard is pretty boring, being almost entirely ionic. Rather more interesting are the molecular orbitals. The most stable π-type is shown below. Many of the orbitals show the Nobelium atomic orbitals non-interacting with the ligand, probably because the relativistic contraction renders them inert to mixing, in a manner which is often used to explain the inert nature of e.g. 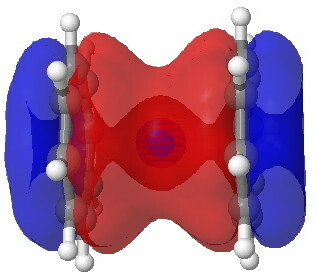 the Pb 6s2 electrons in divalent lead. Molecular orbital for nobelocene. Click for 3D. This entry was posted on Friday, April 29th, 2011 at 7:26 am and is filed under Interesting chemistry. You can follow any responses to this entry through the RSS 2.0 feed. You can leave a response, or trackback from your own site. Saw your Nobelocene entry. I was wondering why Jmol displays pink small atoms: they are labeled Bq, so I thought “becquerel”, but there’s no such element. That’s why Jmol doesn’t recognize it. What is the Bq meant for? Maybe Bk? These are one of two designations used to indicate a dummy or other coordinate centre which has no assigned electrons or charge. X is used for coordinate definitions (as perhaps bond or ring centroids) and Bq for (in this example) the centroid of an ELF basin. If you took a close look at the coordinates, you might also have spotted that they are actually in Bohr, not Å. This I use to prevent some algorithms which are very fond of automatically connecting bonded pairs based purely on distance. 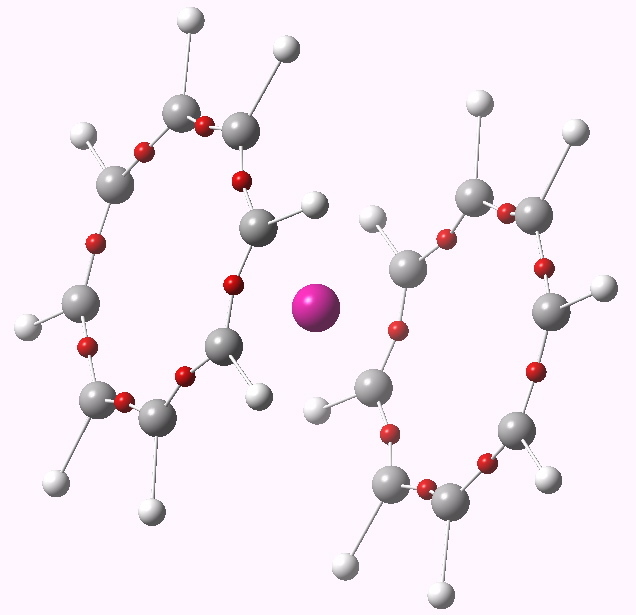 One does not really want multiple bonds to Bq atoms, so using Bohr normally inhibits that automatic connecting process! Hope this clears the mystery up Angel!